It repeatedly absorbs all the data on the Network in order to evolve and grow larger, and is depleting the Digital World to the brink of destruction. 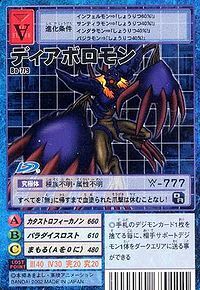 A Diablomon that has absorbed a lot of data becomes convinced that it is an all-knowing and all-powerful being, and it takes pleasure in destruction and slaughter. 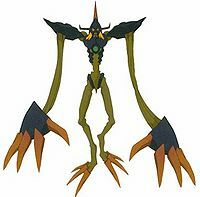 However, when this Digimon congregates in great numbers, its raison d'être is made clear; as that ultimate goal is to hijack a military computer and try to destroy the Real World as well with a nuclear strike, this is a terrifying Digimon. 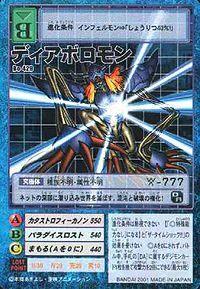 Its Special Move is firing a powerful shot of destructive energy from its chest-cannon (Catastrophe Cannon). 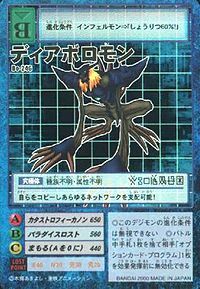 A corruption of "diablo", possibly intended to downplay the "devil" etymology of the Japanese name for the purposes of censorship acceptability. Catastrophe Cannon  カタストロフィーカノン Katasutorofī Kanon Web Wrecker/Inferno Missile/Cable Crusher/Catastrophe Cannon Fires a blast of energy or a missile from the green sphere in its chest. 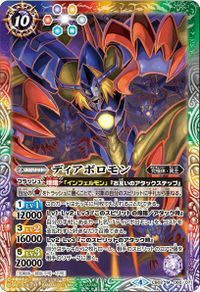 Paradise Lost  パラダイスロスト Paradaisu Rosuto Lost Paradise Unleashes a giant explosion of energy from its chest. System Fail  システムフェイル Shisutemu Feiru System Failure Encases himself with a gigantic green sphere, blasting all nearby opponents away and causing them to devolve. Holds its hands back, charging them, and then thrusts forward, extending its arms and shooting its hands forward. Rolls over and strikes enemies with the blades on its back. Spreads both of its arms outwards and spins in place. 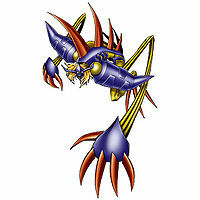 Stretches its arms and launches its huge clawed hands to slash or grab the enemy. Extends its arms to claw the target. Multiply  マルチプライ Maruchipurai Alias Fake Makes a copy of itself. 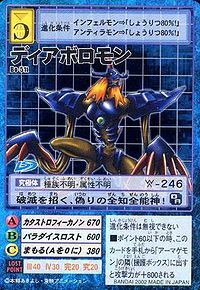 Diablomon is the final evolution of a Kuramon that hatched from a DigiTama originating on the Net. It evolved rapidly by devouring data, eventually taking over most communication networks. 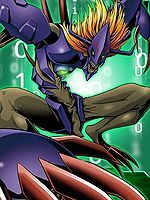 After being attacked by Taichi and Koushiro's digimon, it retaliated by hacking into the defense networks of various military and causing several missiles to be launched. 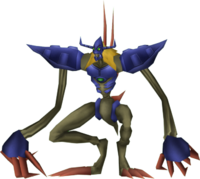 It began multiplying rapidly, but was eventually defeated by Omegamon after it was slowed down by having thousands of emails forwarded to it at once. 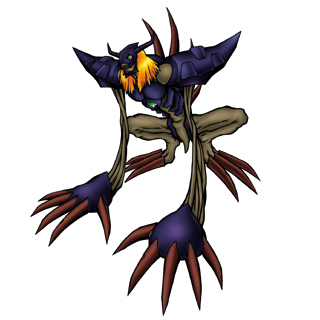 The same Diablomon somehow returned after its initial death at the hands of Omegamon, seeking revenge upon the Chosen Children. He set to work emailing Kuramon and photographs of the Chosen to people in Tokyo, causing countless Kuramon to emerge into the real world. 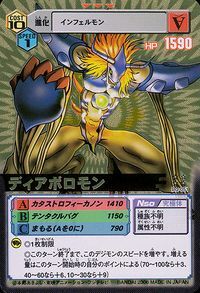 Though quickly defeated by the combined efforts of Omegamon, Angemon and Angewomon, this merely played into his hands as the Kuramon continued to emerge into the real world, forming an Armagemon. When Culumon unleashed his power upon the Digital World to aid the Four Holy Beasts, three Diablomon evolved from the merger of a mass of hundreds of Chrysalimon, and came to aid in the fight against the D-Reaper. 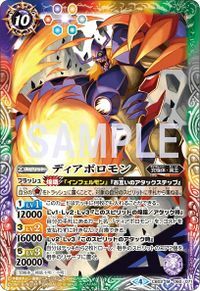 Diablomon appeared in "All Will Be Revealed Now! 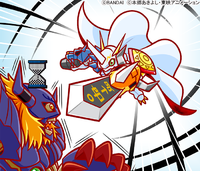 The Secret of the Digimon Hunt!". 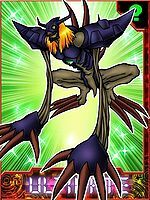 It evolved from an Infermon who had turned the city into DigiQuartz, and after being defeated by Shoutmon X7 it turned into Quartzmon. 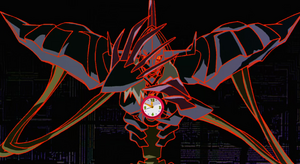 The Watch Man then revealed that the Diablomon they fought had been a copy created by Quartzmon. Diablomon is an obtainable Digimon. Evolves from Okuwamon (20+ DP). 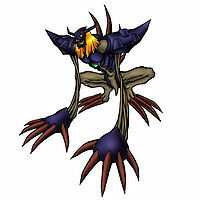 Diablomon evolves from Infermon if above level 45, Dark EXP 25000+, and must have Befriended Keramon. 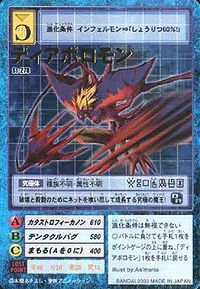 Can evolve to Armagemon by jogressing with Infermon if above level 81, Defense 480+, and Kuramon must be in your party. 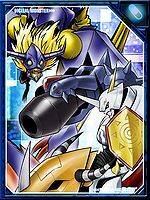 Can evolve to Chaos Dukemon by jogressing with Black Megalo Growmon if above level 63, Dark EXP 25000+, Attack 360+. 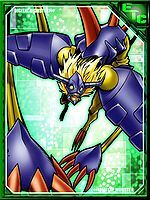 Diablomon is only obtainable as a collectible card. 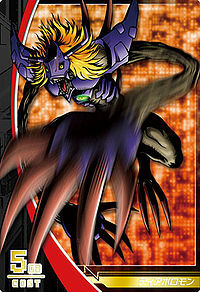 Its card can be unlocked when completing the The Wickedest Virus (最悪のウイルス Saiaku no Uirusu) set. 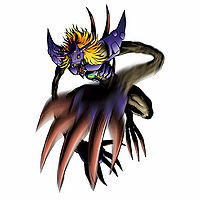 Digimon Adventure's Diablomon appears as part of the 20th anniversary update. 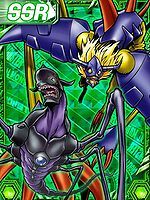 Diablomon is an unobtainable Boss Digimon. An ultimate Virus who feeds on the net and grows, causing destruction and slaughter! It is able to make copies of itself and take control over all networks! Incarnate of chaos and destruction, it destroys the world while lurking in the depths of the Net! Its blood-smeared claw attacks will not rest until they return everything to nothing! It brings upon destruction, an almighty god of lies! 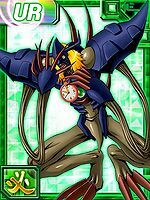 An avaricious Digimon that grew to its size by absorbing data all over the network. It seeks to destroy the Real World by hijacking military computers and firing nuclear missiles. This page was last modified on 15 March 2019, at 10:18.